1/4 cream??? 1/4 of WHAT? a gallon? a quart? a teaspoon? 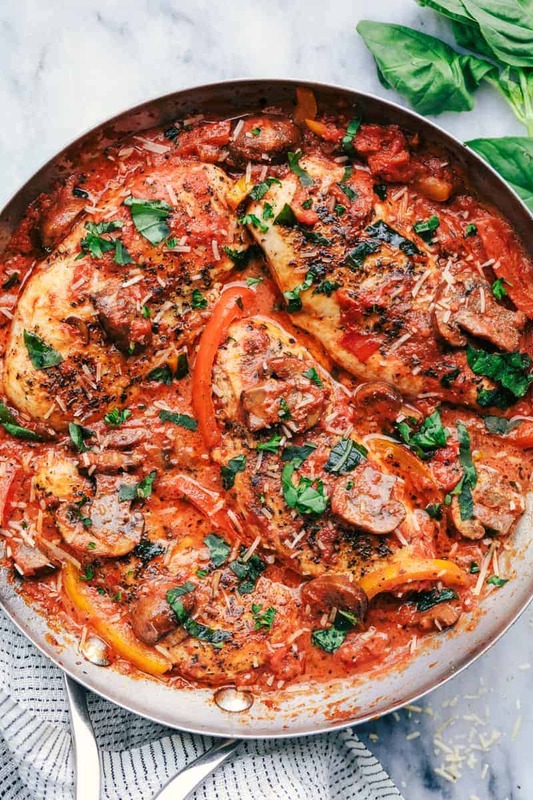 And authentic made-in-Italy cacciatore does not use crushed tomatoes. It uses whole tomatoes sliced or canned whole tomatoes drained. cup. Sorry I will fix that! And this just uses similar flavors. You can definitely make it to your taste! That does sound delicious! Thanks for sharing! I made it and it is amazing!! I was looking for a new twist on the routine and love the cream. Crushed, whole or canned, it is all good! Lonna, I would say this is authentic Made in America Cacciatore. Good for Alyssa for always being inventive. She has a knack for these skillet dinners. I love them all! Lonna-Its an online recipe. Simmer down with the “? ?” and advice on Italian cooking. This looks absolutely incredible! Love the idea of adding a creamy element to a classic tomato sauce. Thanks for the inspiration! I also really like that you used crushed tomatoes. I get Muir Glen Organic Fire-Roasted crushed tomatoes; they taste fantastic and make it so easy to get the perfect consistency for a sauce! with the melding of the thighs and legs. Will let you know how it turns out…. Yes you can! Both ways would be delicious! This was wonderful. I also appreciate using the crushed tomatoes to help the recipe come together more quickly. Another recipe to save. Thank you~! Dying to try this recipe!! It looks absolutely delicious! Can I eliminate the heavy cream as my husband and I are dairy free? I have never tried it without the heavy cream. It may work out great; however, it may not be as thick and the flavor may be different. Let me know how it turns out! Happy Cooking! I cannot use dairy either, I use white wine, and it gives it such a good flavor, add when I add the peppers about quarter to 3/4 a cup. Hi Alyssa. 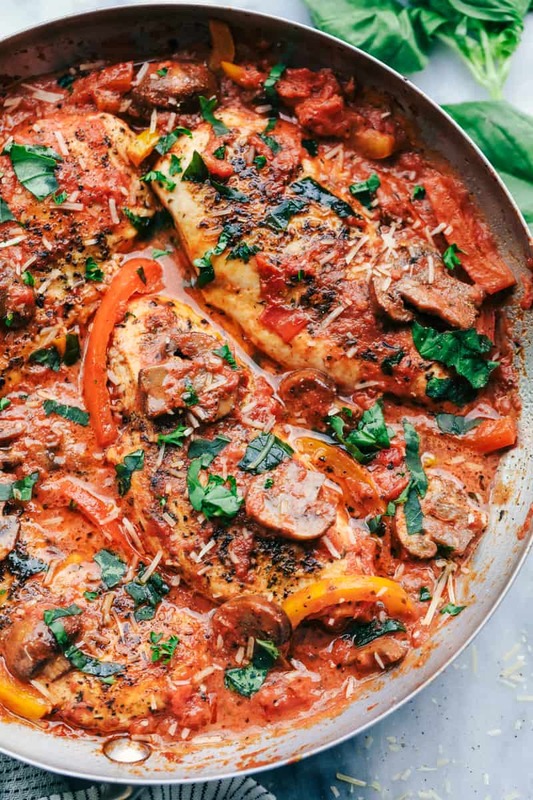 I had mushrooms, chicken and basil to use up and as Saturday night is usually pasta night, I searched Pinterest where I came across your recipe. I’m so glad I did. Everyone commented on how lovely it was and it’s something a bit different to what we usually have. I made this for family dinner Sunday night and everyone loved it. I used a jar of vodka sauce in place of the cream and crushed tomatoes, which made it even easier.e. I served it with polenta instead of pasta and everyone cleaned their plates. Great recipe and so easy. P.S. I agree the comment re “1/4 cup of what” was both silly and rude.. Play nice like mom said. A-ma-zing! Don’t skimp on the spice. Thank you for this easy and yummy recipe. I made this last night for a family dinner and it was a huge hit! I threw in a little zucchini and added a little extra cream. A salad and garlic bread and done! Super easy – and directions were very easy to follow, this is definitely a keeper!! My family loved it! Used sphaghettti squash jnstead if noodles. We have tried a few recipes from your site and all have been hits! 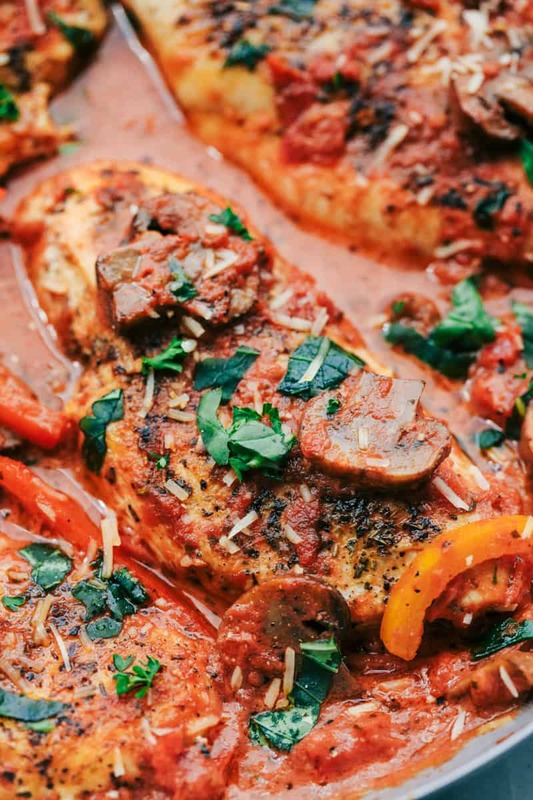 The chicken cacciatore recipe is so good. I followed every ingredient and instruction and the dish came out so great. My family loved it. Thank you. Hubs and I LOVED this. I modified slightly to use the ninja cooker. I used thighs and after browning and sautéing all ingredients I gave it a few hours on low on slow cook setting. I will definitely make this again. Can you use half and half in by chance? Don’t want to head to store. Yes, that will work with this recipe. Can i use a slow cooker for this recipe? 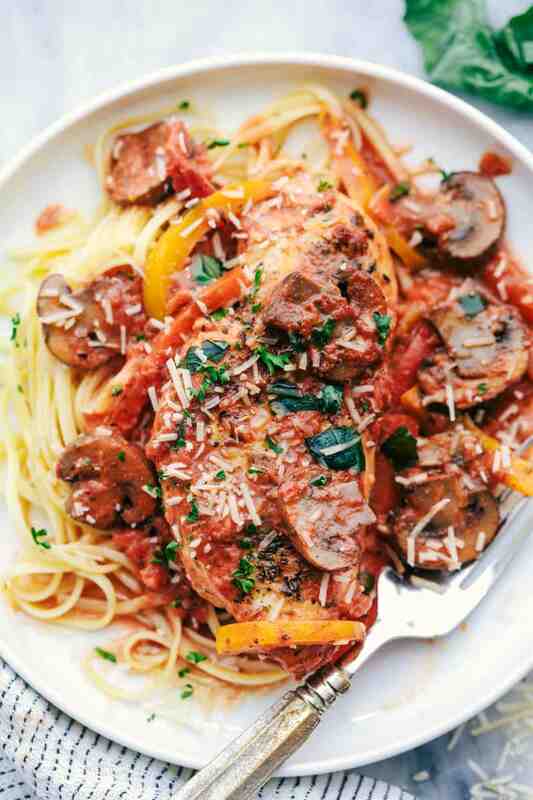 Should i brown the chicken, saute the vegetables before adding to the slow cooker? Yes, of course! That sounds delicious. I would add it all together in the slow cooker. I have not tried it this way. Let me know what you think and what you did! Thanks so much for following along with me! Can’t do bell peppers of any sort, but really want to try this recipe. Saw someone added zucchini and that’s an idea. Also maybe onions — any other ideas?? Thanks so much for your help. Love your recipes and how FAST they are, not to mention always a hit!! You are a life saver!! Aw! Thanks! That is really sweet of you! I am glad that you have found some recipes that you love! Zucchini, green beans or asparagus work great for this. Hope that helps! You are welcome to omit the mushrooms. Thank you for yet another recipe, Alyssa! Can’t wait to see which one I will try next! This was just fabulous! Our house had the best aroma while cooking. My husband is the most picky eater & he finished his plate, mushrooms and all. I added capers, which added a little twist. I love all your recipes. Great job!!! !